The secret is out! Now you can be the envy of all your friends at your next get together! Deep in a bank vault somewhere in the mid-west, there was a piece of paper with 13 common ingredients on it. If you mixed those items in just the right proportions under the proper conditions, you could create the world’s best pork loin rub recipe. Rumor had it that only one individual knew the exact formula from that piece of paper in that mysterious vault. That individual’s name was Don. Special undisclosed measures were taken to ensure the safety of Don, as if he were royalty. After many years of serving up the secret recipe to billions of people across the globe who came to experience the taste of this secret recipe, Don decided to share the secret recipe. No one knows why Don decided to share his secret recipe with the world. Some analysts have speculated that he was probably just getting tired of spending all of his time cooking for everyone, so he decided to share the secret recipe so that everyone could cook great tasting pork loins on their own. We managed to get a hold of Don’s secret recipe and we’re going to share it with you so that you can cook great tasting pork loins just like Don does. Combine all ingredients. Rub surface of pork with mixture, roast over indirect heat to internal temperature of 140-150 degrees – use a meat thermometer. Let roast or chops rest for 5 minutes before serving. Use only amount needed to cover loin. Store remaining amount in an airtight container. A single batch (as made above) will do 10-15 pounds of pork loin. Don’t want to make it? Then buy it! 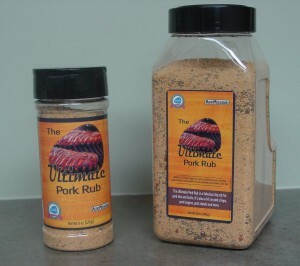 Contact the MPA office at 573-445-8375 for more information or to purchase The Ultimate Pork Rub! Combine all ingredients and pour over thick-cut chops. Cover and refrigerate for at least 2 hours. Grill Chops over low to medium coals for 30-45 minutes or until internal temperature reaches 145-150 degrees. DO NOT OVERCOOK! For best results, use a meat thermometer to check internal temperature of meat.